CLIMAplusSECURIT™ partner Glas Wulfmeier manufactures the complete pallet of Saint Gobain specialist glass products under the most stringent quality conditions. CLIMAplus™ Insulating Glass units and SECURIT™ tempered and laminated safety glass products with the latest high-spec glass coatings are processed on state of the art machinery at the impressive modern facility in Bielefeld. And that now includes the unique SHAPESEAM-PRO™ robotic seaming/arrissing line from Ashton Industrial. SHAPESEAM-PRO™ needs no pre-programming or shape library. It incorporates its own scanner which automatically detects the shape and size and position of any glass and then seams it all round before sending it through the attached washing machine, to their modern tempering furnace. 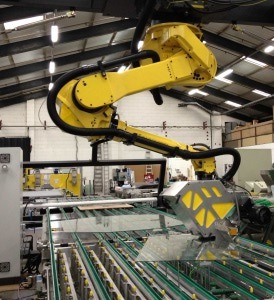 Randomly loaded rectangles and shapes of flat glass like full circles, ovals, triangles and any symmetrical or non-symmetrical multi-sided pieces represent no problem for the robot, which can handle sizes up to 4400 x 2400mm. Glas Wulfmeier is the industry pioneer in this regard, working in close cooperation with Ashton Industrial to perfect the design and software under real production conditions since January 2015. 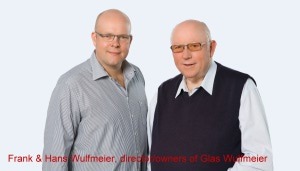 Founded back in 1929, the family business was started by Arthur Wulfmeier and now, over 85 successful years later is in the very capable hands of Mr. Frank Wulfmeier, the third generation of family management. 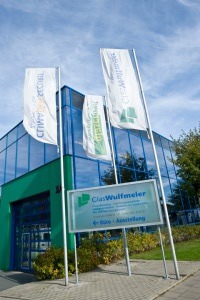 With the beginning of insulating glass production in 1970 and a program of continuous expansion steered by Mr Hans Wulfmeier, now enjoying his well-earned pension years, Glas Wulfmeier has grown from a simple glazing and wholesale business to a highly prosperous industrial processor. So successful has growth been that the business has been forced to move premises twice to gain the necessary additional factory space. 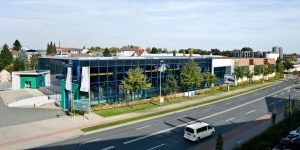 The current premises were acquired in 1998 and just 10 years later were further extended to accommodate the production of tempered glass, making Glas Wulfmeier one of the biggest and most comprehensive manufacturers of flat glass products in the region of Ostwestfalen. To see SHAPESEAM-PRO™ in full action (featured in our VIDEO LIBRARY) click here.